Leaving the Armed Forces can be a daunting prospect. After years of living a structured lifestyle which could involve fighting on the front line, entering what might seem like the comparatively quieter civilian world can take its toll if the transition isn't properly handled. Report by Leigh Hamilton. Around 20,000 personnel leave the Services every year. This can be due to a natural end to their commission, redundancy, or medical discharge. Each of these individuals has access to tailored support and advice years before they are discharged, to ensure they are as well prepared as possible. The Career Transition Partnership (CTP), which is a partnering agreement between the Ministry of Defence and Right Management, provides resettlement services for those leaving the Royal Navy, Army, Royal Air Force and Royal Marines and also acts as an intermediary for employers wishing to hire Service leavers. To date the CTP has helped over 170,000 personnel with the tricky transition to civilian life by offering guidance, workshops and courses. Leaving the Armed Forces can, in some respects, be like starting again from scratch. The CTP understands how complicated creating a new life can be, and provides advice on all aspects of civilian life including; approaching the job market; how to claim benefits; housing; health and education; pensions and interviewing skills. Advice, guidance and support are available from the CTP two years before discharge until two years after leaving Service, if the individual is eligible in accordance with current policy. After receiving word that they are leaving the forces, a Service leaver is given a briefing which clearly outlines what they can expect in the coming months and they will be given in-Service resettlement advice before attending a three-day Career Transition Workshop (CTW). Obviously it’s a scary time for a lot of people and we’re aware of that. The first thing Service personnel need to do is get registered with the CTP through their Service Resettlement Advisor and get the process started. Then, they can go on the three day transition workshop. They’ll start to work with a career consultant. “They will develop and follow a Personal Resettlement Plan which will include resettlement activities to meet the needs of the individual and aspirations for their future career. > > This includes further CV and interview techniques workshops, vocational training and equipping them with the tools and knowledge to market themselves to future employers. Service personnel possess a wide range of skills which make them very valuable assets to civilian employers. Their military background provides skills and a work ethos that would be an asset to any organisation. Some Service leavers worry that their military skills and experience will not transfer into civilian roles. Attendance at a CTW and working with a Career Consultant will help to translate those skills and many are surprised at what they do have to offer such as leadership, teamwork, planning and motivating. These soft skills are important to employers and we work with many who are willing to train Service leavers because they value the skills they possess and they can see that they will be an asset to the company. Lieutenant Commander David Sargent is one of the many Service personnel who have benefited from the CTP. 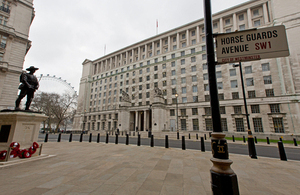 He was notified in September 2011 that he was being made redundant as part of Tranche 1 of the Armed Forces Redundancy Programme following the Strategic Defence and Security Review. After serving for almost thirteen years as a Logistics Officer with the Royal Navy, Lt Cdr Sargent relied heavily on the guidance provided by the CTP during the year before he left the Armed Forces. When I attended I was still in shock after being made compulsorily redundant,” Lt Cdr Sargent said. “So, initially I had thought very little about resettlement. The CTW was a real wakeup call and made me think very long and hard about what I needed to do. It got me into the job seeking mindset. During his military career, Lt Cdr Sargent gained extensive experience in logistics and supply chain management and also headed up a number of different departments. After beginning an MSc in Logistics Management through the Navy, Lt Cdr Sargent discussed his options with his Career Consultant, and he soon came to the conclusion that continuing with this qualification would not make the best use of his Graduated Resettlement Time (GRT). I found myself referring time and again to CTW and the notes I was provided with. Certainly as my job search continued, I found the lessons learned were more and more relevant. I saw the job specification and realised that it was almost identical to that of a Naval Logistics Officer. A little more research showed me that the traditional Naval term for my branch, Purser, shares the same Latin root as Bursar. The case seemed to make itself! So, on the face of it, it was a step change, but it actually saw me playing to my strengths and also looking at education, which is what I really wanted all along. Be it management of people, things, money, infrastructure, the experience gained has proved utterly invaluable. I made the decision that a good job wasn’t solely about the money. Locality, time off, environment, etc, were all equally important. In less than two months, Dave Sargent has made a palpable impact our school. Dave’s learning curve has been very steep with some rather sharp edges and he is managing the job superbly well. Changes in family circumstances can be a catalyst for some personnel to seek voluntary redundancy. I have a three-year-old daughter,” she said. “The RAF was great when I was young, free and single and didn’t mind travelling. I did Kosovo, Bosnia, Basra, Baghdad and Afghanistan. Having little kids and going away just doesn’t suit me anymore, so I applied for voluntary redundancy which was a good way out for me. I found it really useful, especially the guidance on CV writing as most of us who go straight into the military have never had to write a CV. I thought I should focus on defence management jobs, but my career consultant encouraged me to think of other areas. Before I joined the Air Force I wanted to teach, so she encouraged me to look into that area as well as project management. The meeting with her was so useful, she knew so much. There were four people interviewed and the other three guys were all qualified teachers. I’m not a qualified teacher, and the others were also a bit younger than me and I just thought they’re not going to want an unqualified and older person. I left thinking nothing about it and got a call the next morning offering me the job. Although she was elated to find out she had successfully made the transition into a civilian job, Mrs Murnane was put to the test as she had to move house and look after a three-year-old child on her own as her husband, who is also in the RAF, was on deployment in Afghanistan. When kids are messing about, it’s important to be able to control them. When I got hit in Baghdad, that was quite scary and it got the adrenaline pumping. Kids playing up in the classroom is comparatively not scary at all. Don’t give up job hunting and don’t get too demoralised. You may not find a job immediately. You’ve got to find a job that suits you and don’t underestimate the skills that the military has given you; confidence; being able to deal with lots of different situations; and not getting phased by things. With the help, guidance and support of the MOD through the CTP, life after active service has the potential to open new doors and present new opportunities that personnel may not have expected. See Related Links for information about the CTP .